Trouts taste great when baked or grilled with select herbs and spices. There are several varieties of trout so use the best one available in your locality. Make sure you keep the proportion of butter and seasoning ingredients intact as mentioned below. You can also add baby potatoes, tender spinach leaves, and bell peppers to the baking dish. Although butter is one of the primary flavoring agents in this recipe, you can replace it with olive oil. I've kept the head and tail intact which can be removed if preferred. Similarly, you can also opt for a coal fire grilled version, instead of baking it in an oven. So, get your oven ready to make this delicious, light and mouth-watering baked trout preparation. Grease oven-proof baking dish with a cooking spray. 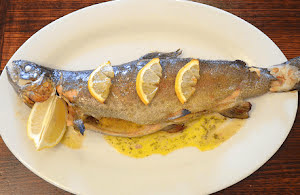 Divide melted butter into two equal parts and brush both the trouts inside out with it. From inside, season with ground black pepper and finely minced garlic. Evenly sprinkle dried dill and rosemary inside. Arrange 3 to 4 lemon slices above the dried herbs. Pour the remaining melted butter on top. Bake in a preheated oven for about 20 to 25 minutes at 400 °F.